Is constitutionalism incommensurable with Chinese socialism? China’s legal system is vast and complex, and robust scholarship on the subject is difficult to obtain. Inside China’s Legal System provides readers with a comprehensive look at the system including how it works in practice, theoretical and historical underpinnings, and how it might evolve. The first section of the book explains the Communist Party’s utilitarian approach to law: rule by law. The second section discusses Confucian and Legalist views on morality, law and punishment, and the influence such traditional Chinese thinking has on contemporary Chinese law. 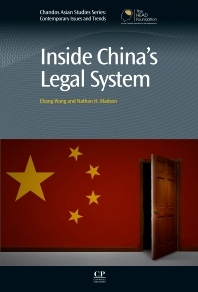 The third section focuses on the roles of key players (including judges, prosecutors, lawyers, and legal academics) in the Chinese legal system. The fourth section offers Chinese legal case studies in civil, criminal, administrative, and international law. The book concludes with a comparison of China’s fundamental governing and legal principles with those of the United States, in such areas as checks and balances, separation of powers, and due process. Chang Wang is associate professor of law at College of Comparative Law, China University of Political Science and Law in Beijing, as well as Chief Research and Academic Officer for China for Thomson Reuters. He also serves as adjunct professor of law at the University of Minnesota Law School and William Mitchell College of Law in the United States, guest professor of law at the University of Lucerne Faculty of Law in Switzerland, and Guest Lecturer on American Law and Culture at Beijing Royal School in China. Chang holds a B.F.A. in Filmmaking from Beijing Film Academy, an M.A. in Comparative Literature and Comparative Cultural Studies from Peking (Beijing) University, an M.A. in American Art History from University of Illinois at Urbana-Champaign, and a Juris Doctor from the University of Minnesota Law School. Chang has been admitted into law practice in Minnesota, the District of Columbia, and federal courts. He has published a book on comparative cultural studies and more than 100 academic articles on law, critical theory, and art history. Nathan H. Madson is an attorney living in St. Paul, Minnesota. He has an extensive background in international and domestic human rights, working and volunteering with such organizations as the Queer Legal Aid Society, The Center for Victims of Torture, The Advocates for Human Rights, OutFront Minnesota, and the U.S. Committee for Refugees and Immigrants. Nathan has guest lectured on Chinese law and Chinese ethnic minorities at the University of Minnesota Law School and the William Mitchell College of Law, USA. In addition, his research includes non-normative methods of legal and public policy reform. Nathan received his B.A. in International Affairs from The George Washington University and his Juris Doctor from the University of Minnesota Law School, USA. He has been admitted into law practice in Minnesota.